The interchange of I-275 and State Route 32 in the Eastgate commercial district is the preferred route for residents and severely congested during rush hour. The Ohio Department of Transportation (ODOT) determined a redesign was required to reduce congestion and vehicular accidents. After an extensive study, it was determined that the best solution was to eliminate two loops of the cloverleaf, add a flyover ramp, revise two entrance ramps, and rework the interchange at Eastgate Boulevard. The new layout included seven new bridges. "A bridge was needed to provide separation for the southbound I-275 exit to eastbound SR 32 with the eastbound SR 32 exit to Eastgate Boulevard," stated Steve Mary, P.E., Senior Transportation Engineer with Stantec Consulting Services Inc. "The I-275 flyover ramp was braided with the eastbound SR 32 exit to Eastgate Boulevard to enable the southbound 275 traffic to pass under Eastgate Boulvard without stopping." At the exit ramp M from I-275 location, the skew between the crossing roadways was so great (70 degrees), ODOT engineers decided the tunnel should be a precast concrete three-sided culvert for its ability to eliminate the skew issues, while also reducing construction and maintenance costs. A 48' x 12' CON/SPAN® B-series® Bridge System, 268' in length, was selected as the best solution. "The CON/SPAN option eliminated the highly skewed bridge that was originally proposed at the braided ramp," added Mary. Approximately half of the structure is on a 5 degree, 45 minute curved alignment to match the roadway passing through the structure, while the remainder is on a tangent alignment. 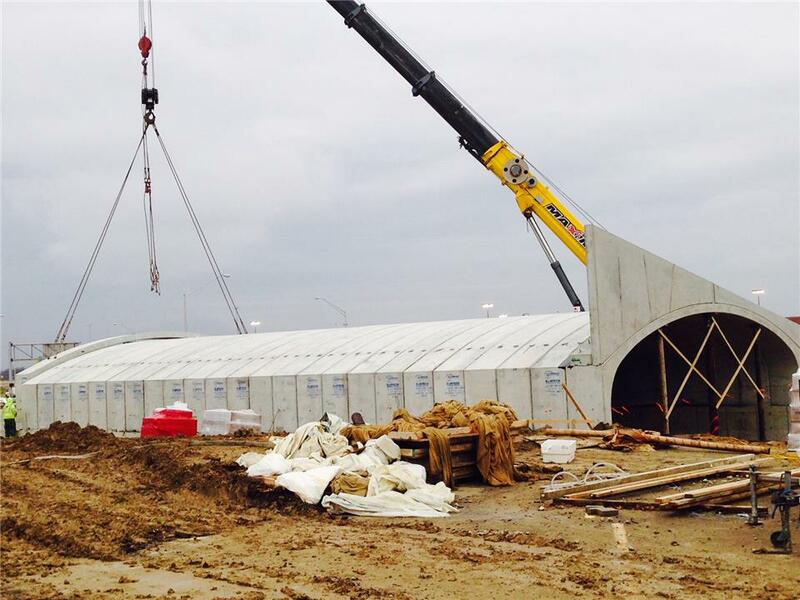 In order to provide sufficient vehicular clearance through the structure, it was placed on cast-in-place 19' high concrete walls. The roadway passing through the structure consists of two 12' wide lanes and 10' and 4' wide shoulders. 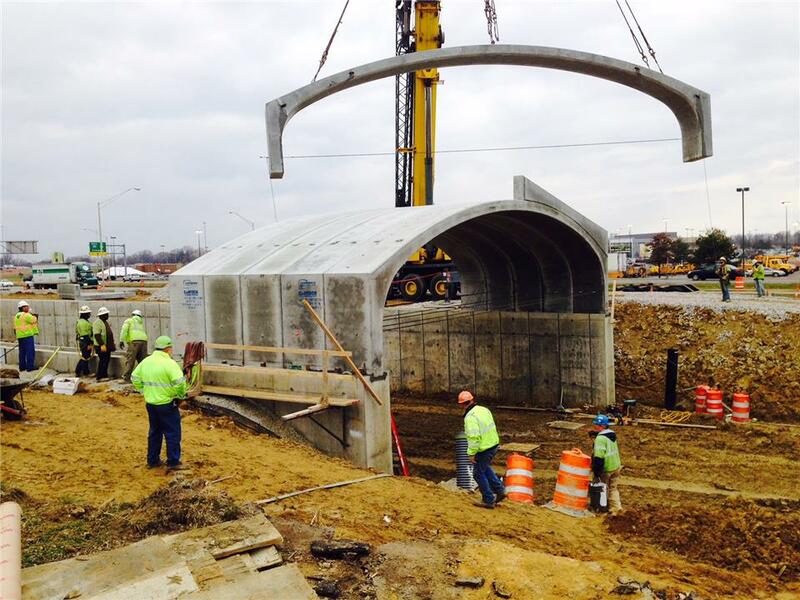 "The installation of the CON/SPAN structure went very well," stated Randy Westendorf, Project Manager, with John R. Jurgensen Company. "The arches arrived promptly in the requested order of sequencing. All segments of the structure were fabricated with the utmost quality, allowing us to successfully erect the structure within five work shifts." The durability of the structure was further enhanced by the application of a rubberized asphalt peel-and-stick membrane to the top and sides of the exterior surfaces. An epoxy-urethane sealer was applied to the interior faces to protect the concrete from deicing materials during the winter. Since the structure was 268' long, lighting was installed inside the tunnel to light the way for drivers. The intensity of the light is controlled by a computer day and night, providing safe passage. The interchange redesign project was completed in September 2015. The traffic flow is much improved in the area and the CON/SPAN tunnel provides a unique gateway to the Eastgate commercial area. "It was the best option considering constructability, construction time, long-term maintenance, and aesthetics," concluded Mary.